‘They’re so frightened of being wrong they have exempted themselves from being fashionable’ says British artist Grayson Perry in today’s headline in The Independent. He is referring to the personality-free trend in fashion which could be extrapolated to the fearful norm-driven world we live in. Is being inoffensive, non-descript and safe serving the civilization? How does this transfer to style in the workplace? Any workplace has its subcultures. Take a hospital, the doctors generally don’t mix with the nurses, and the technicians are a culture of their own. Some would attribute these divisions to hierarchy, but there is also an element of workstyle. Each subculture almost has its own language; there are types of people that prefer certain types of work. These differences are not inherently bad; they just are. If these types of people worked better together, understood one another’s language and yet had no expectation that one would begin to behave like the other, you might get a more interactive, dynamic work culture. What if we had a cosmopolitan approach to dealing with different work styles? 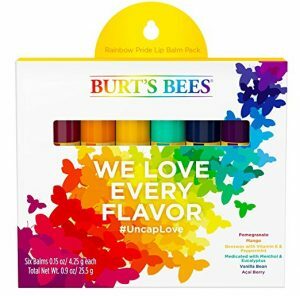 Instead of attempting to create a melting pot or a smoothie out of our diversity, how about fully imagining the potential of each person and appreciating that supporting unique style has more potential to create delicious possibility? Cooperation is often confused with compliance or conformity. Perhaps because it’s easier for the mind to grasp, there is often a push in societies and workplaces for everyone to adhere to the same norms. Collective potential is maximized when we steer away from conformity and more toward imaginative collaboration based on the appreciation of the potential of many independent and unique styles. In order to effectively mix different styles, it’s important to understand the distinct nature of your own style and that of others. An understanding of aesthetic or taste can help identify different styles without them being seen as a source of conflict, but rather an appreciation of human possibility. Understand style/identity and have an encounter with oneself and then the other – Be able to self-assess style, beliefs, values and ideas as they change. Seek encounters that create engagement, dialogue and critical inquiry, practice the ability to communicate and perceive. Engage in different style types for active problem solving, invention or design! In the same vein, my art practice does not discriminate audiences in the application of art but almost always disrupts a habitual pattern to inspire a personal or social shift. As Creative Director of limeSHIFT, our art interventions have influenced empathy, community and leadership in private companies, universities and neighborhoods in Boston, Chicago, and New York City. Many of our working practices are directly informed not just by individual artistic processes, but also by the working modes of artist collectives. An artist collective is an initiative that is the result of a group of artists working together towards shared aims. These aims can include almost anything that is relevant to the needs of the artist, ranging from purchasing bulk materials, sharing equipment, space or materials, through to following shared ideologies, aesthetic and political views or even living and working together as an extended family. Sharing of ownership, risk, benefits, and status is implied, as opposed to other, more common business structures with an explicit hierarchy of ownership such as an association or a company. The aphorism “a rising tide lifts all boats” is associated with the idea that improvements in the general economy will benefit all participants in that economy. Beyond sharing materials and ideologies, artist collectives have showcased time and again that collaborative processes tend to benefit all of the members of any given community. What is it about the corporate environment that makes listening such a difficult-to-achieve skill? 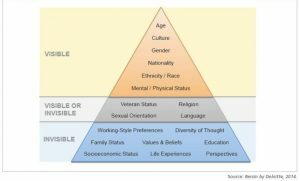 While listening may come naturally to introverts, are there ways to effectively cultivate it (besides reading how-to articles)? I recommend a creative outlet. 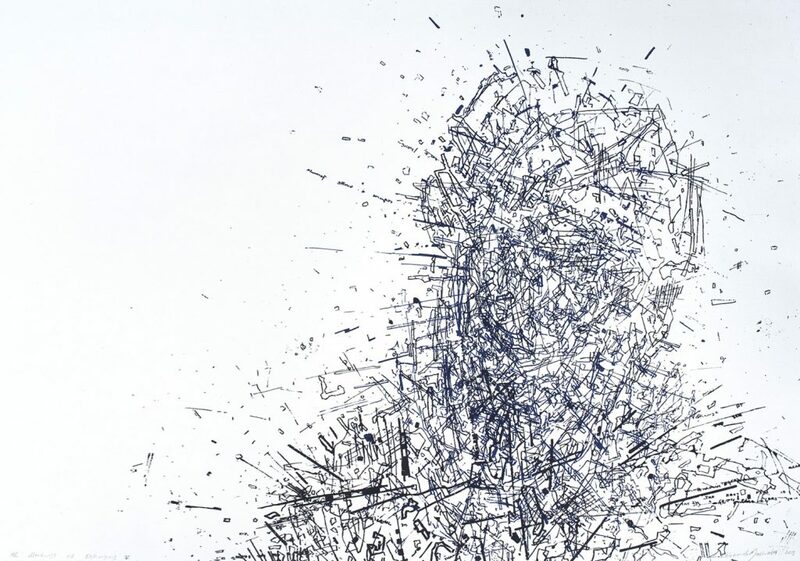 The link between listening and creativity is tied to relinquishing control. We have to let go of the outcome, be receptive and embody vulnerability to truly explore an idea and, in fact, a conversation. The act of being able to live for an extended period of time in ambiguity requires the same mentality whether creating a new type of art or listening to an unfolding discussion. A frequent refrain from artists is that the material “speaks” to them. Whether your material is a blank canvas or an employee, letting creative ideas surface requires the act of listening. Give it a try and you may be surprised by the results. Gender-diverse companies are 15% and ethnically-diverse companies are 35% more likely to outperform their peers. Companies with more women on their boards outperform their peers over a long period of time. Inclusive teams outperform their peers by 80% in team-based assessments. 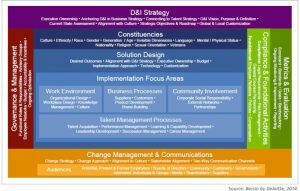 The below framework offers an overview of how Diversity & Inclusivity flows through organizations. Money Center: Walmart offers millions of unbanked and underserved customers a series of low-cost financial services through in-store Money Centers (check cashing, bill payments, money transfers, MoneyCard, etc.). Direct Farm: a global program focused on driving agricultural sustainability. In 2010, Walmart China engaged more than 470,000 farmers in the Direct Farm program. The company endeavors to reduce produce waste by 15 percent while upgrading 15 percent of Direct Farm program products from Green to Organic certified. At L’Oréal USA, Balanda Atis, a group leader in research and innovation, initiated a project to explore problems non-Caucasian women face. “As a woman with darker skin, I have always had a difficult time in trying to find a shade of foundation that was appropriate for my skin tone. Furthermore, I know that this is a concern for consumers.” Her team conducted a series of interviews nationally with women and measured skin tones. Atis and a team of scientists demonstrated scientifically that women of color have specific needs giving the company a competitive advantage leading to Mizani, a L’Oréal brand that targets women of color. Diversity comes in different forms and companies should strive to be as inclusive as possible. Steve Jobs said, “The source of wealth and capital in this new era is not material things … it is the human mind, the human spirit, the human imagination and our faith in the future.” Let’s cultivate that and create better businesses in the process. Peter Kibunja (Kenyan, b. 1975). 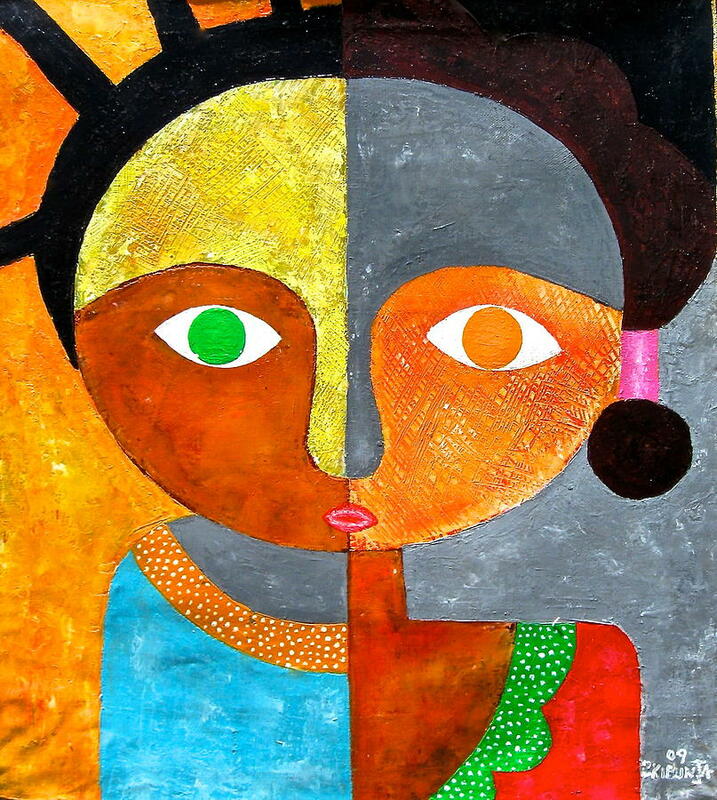 Face II, 2014. Acrylic on Canvas. You don’t have to have experienced a terrorist attack to be prejudiced. I’m sure those of us that consider ourselves pluralistic still in some way have visceral reactions to certain types of people. A familiar narrative for me are our schools, faiths and families that teach us to be open and respectful of all, but ultimately are less accepting of us marrying ‘the other’ or inviting the other into our most sacred or familial spaces. In Elaine’s case, she had an understandable emotional reaction. In the current state of the world, we are all directly or vicariously faced with fear. Right now, particularly in America, everyone is afraid, Muslims, black people, while people, Latin Americans; we’re all afraid. Our prejudice or our experience of prejudice is real and difficult to address. Our incapacity to accept the Other, to learn from the other and as the Aga Khan says “to see difference as an opportunity rather than a threat” is a pathology perpetuated by our lack of empathy. It’s subconscious, deeply ingrained and difficult to dislodge. As much as we read about the need for empathy and humanity and the true wonder of diversity in the world, fear trumps intellect. Emotions drive deep, history is remembered. Intellectualizing pluralism only goes so far. The discovery that humans are genetically 99.9% identical hasn’t helped us live respectfully. Developing admiration for ‘the other’ and not purely tolerating them will not happen within the isolated confines of our hearts. Unless an extension is made to that ‘other’ the exchange of love and learning cannot take place. After fifteen years of grappling with conflict transformation, I understand that pluralism is not an end state but a constant process of exchange, of gesture, and community solidarity. Art and beauty have a way of not only providing that gesture and exchange but allowing for imagination to reconstruct our relationships between people, communities and nations. It’s also an invitation to ‘the other’ to step into your shoes. It is a means through which we develop admiration and not just tolerance. A means through which you learn to appreciate different interpretations without imposing them, and participation in creating art is a way of having voice and extending a gesture to those that engage with it. Elaine talks of her struggle to overcome her visceral reactions and her deliberate process to recognize individuality and diversity, to directly engage and learn from ‘the other.’ The alternative, which is to label the other “erases their humanity and historically has been used to justify heinous acts.” Elaine and limeSHIFT are now working together to use art as means of reflecting on our collective leadership and custodianship in the world. A form of leadership that extends itself to those beyond our sight and brings them into the constellation of those that we see. Lehlogonolo Mashaba (South African, b. 1983). Markings Of Belonging V (Studio), 2014. Ink on paper. How can the arts be used to help humans gain cultural awareness in order to benefit the collective whole? When I first encountered this question I was a little dumbfounded. I could not tell the question’s head from its tail. At first, I identified that it was confusing to think about using the arts to ‘gain cultural awareness.’ What is the relationship here between ‘arts’ and ‘culture’? The arts are a physical manifestation of the internal creative impulse of any given place and its people. The arts are a physical manifestation of culture. As a result the arts makeup a significant percentage of how humans communicate with each other and see each other. As such, diversity training is simply learning to be more conscious of how you communicate with and perceive others. Using music, dance, story-telling, literature and other forms of expression are powerful ways to learn about expression. Honing in, expanding upon, and polishing off how you see other people within the world around you. Becoming aware of others’ mode of operating is essential to our own success. Understanding our similarities and our differences is the foundation on which one builds healthy relationships. To use the arts to gain broader consciousness is a meaningful pursuit. I am particularly interested in exploring how the visual language component of how we express ourselves informs how we engage with each other. Which is to say, if we are going to point to our differences I believe that we must also point to our similarities. It just so happens that we all engage with the world through our sight. We all have eyes. How those eyes translate color, shape, and depth differently from villages in the north to villages in the south is part of what makes my work as an artist so exciting. We all react differently to visual cues, but we are all reacting nonetheless. There is great potential in exploring these reactions and how they translate from person to person and group to group. 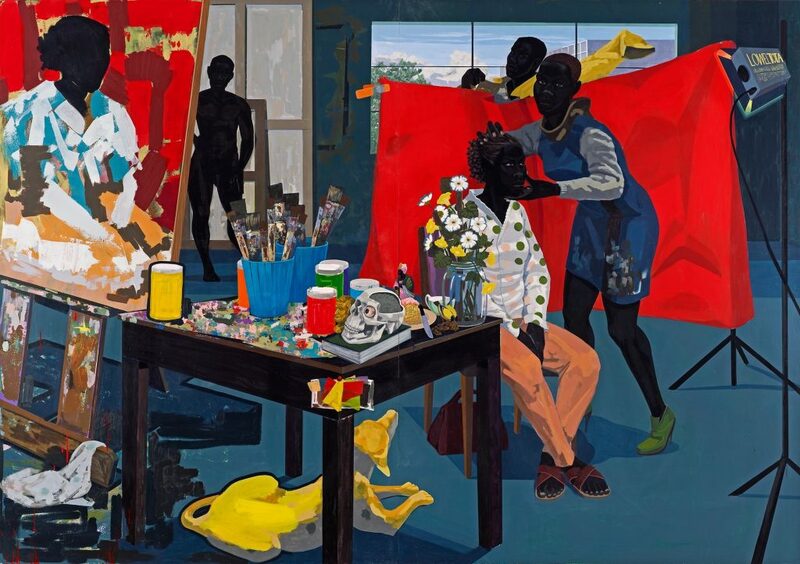 Kerry James Marshall (American, b. 1955). Untitled (Studio), 2014. Acrylic on PVC panels. An inspiration is a happy moment that takes us by surprise. 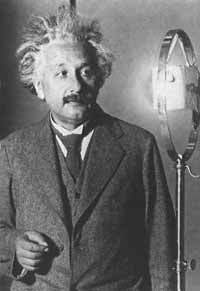 Many people are so startled by an inspiration or a condition of inspiration, which is so different from daily care, that they think that they are unique in having had it. Nothing could be further from the truth. Inspiration is there all the time for anyone whose mind is not covered over with thoughts and concerns, and [it is] used by everyone whether they realize it or not…It is an untroubled state of mind. Of course, we know that an untroubled state of mind cannot last, so we say that inspiration comes and goes, but it is there all the time waiting for us to be untroubled again. We can therefore say that it is pervasive. 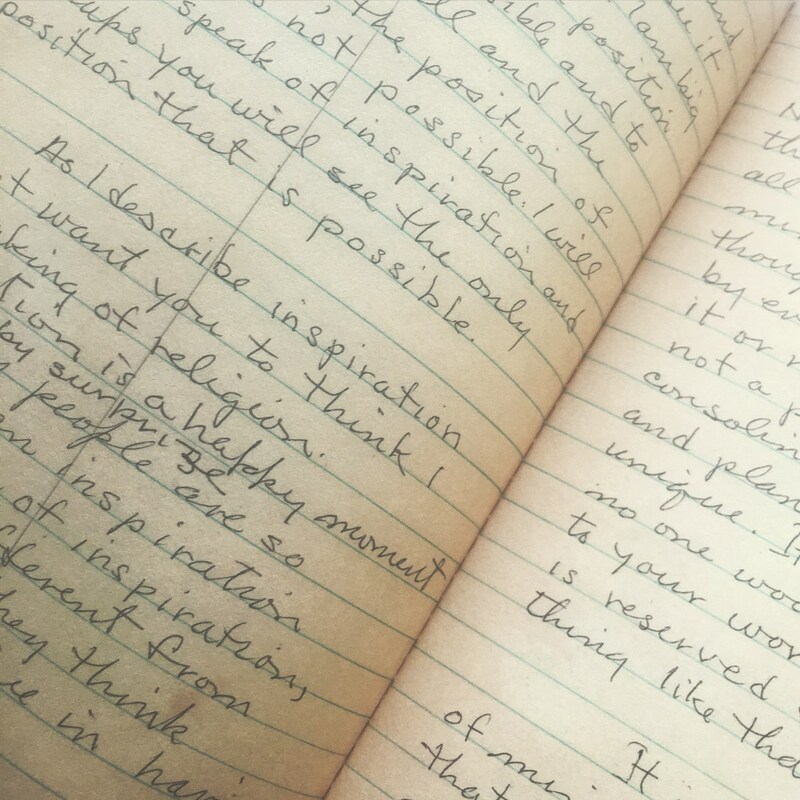 With that said, I am grateful that over the past decade I have cultivated patterns in my life that have kept inspiration around me continuously. These patterns have been woven in through the acts of traveling, reading, and conversing. All three are variations on choosing to get lost in other people’s lives. Young children have more time in which they are untroubled than adults. They have therefore more inspirations than adults. The moments of inspiration added together make what we refer to as sensibility — defined in the dictionary as “response to higher feelings.” The development of sensibility is the most important thing for children and adults alike, but is much more possible for children. I believe that it is children’s insatiable curiosity that sets them apart from adults. As we “grow up” and face the many responsibilities that come with adulthood we build patterns that keep us from asking questions and engaging in the world the way a child would. What if we made it a priority to go to spaces we never occupy? What if everyday we left our homes with the intention of meeting someone new? Everyday. Ultimately, the inspiration for my work comes from the people I encounter moment to moment in my life. Plato once wrote, “Be kind, for everyone you meet is fighting a hard battle.” Through my practice as an artist I am interested in exploring how we can be soldiers in each others’ armies collectively engaging in the sadness and joy that comes with being human. 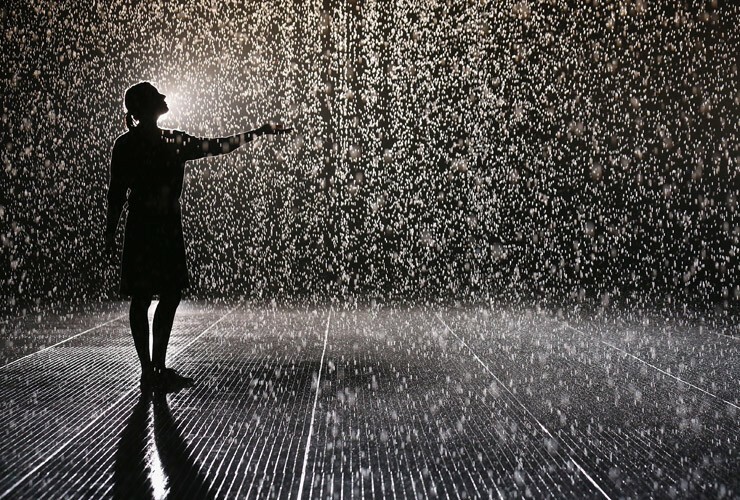 TOP 5 Art & Society Quotes from some of the cultural legacies that drive us! 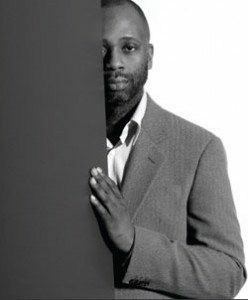 Theaster Gates is a Chicago-based American Social Practice installation artist committed to the revitalization of poor neighborhoods through combining urban planning and art practices. One of the premises of limeSHIFT’s work is that beauty leads to participation and participation leads to collective action. Experiencing beauty is not only a coveted experience but an invitation to share that experience. 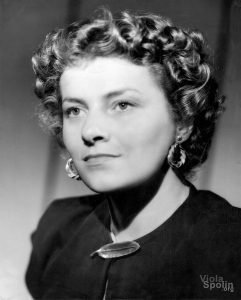 Viola Spolin is considered a godmother of theatre games and her practice is known for its capacity in being able to reach across divisions of culture. At limeSHIFT our method focuses on heightening sense of perception and reinventing an individual’s aesthetic and social relationship to their environment and cultural eco-system. 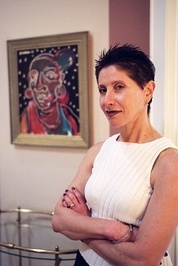 Doris Sommer is the author of The Work of Art in the World and Bilingual Aesthetics and editor of Cultural Agency in the Americas. Sommer has been a mentor to limeSHIFT as it considers the role of art in leadership and democracy. Like we do, she believes beauty is a form of participation. 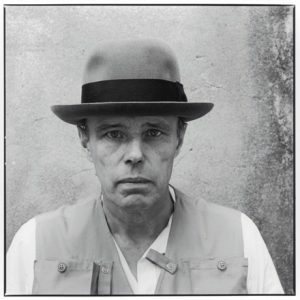 Joseph Beuys, performance artists, sculptor and art theorist believed that art is only possible in the context of society and that we are all co-creators of social architecture. limeSHIFT’s workshops from Lead to Shift, to Creative Workout to Collective Potential help groups discover their possibility as architects of transformation through creative processes. If you’ve ever wondered why caring about employee engagement is important, the above intimidating statistics may catch your attention. Yet, the conversation among business leaders is rarely on whether or not employee engagement is important (it is!). The disagreements instead lie in how to improve it. Employee engagement is a tricky problem to diagnose since it depends on an intricate set of drivers from across the organization, including ones outside of the employee’s defined role, such as Work/Life Balance, Physical Work Environment, Play, People, Sense of Accomplishment, Brand Alignment, and more. 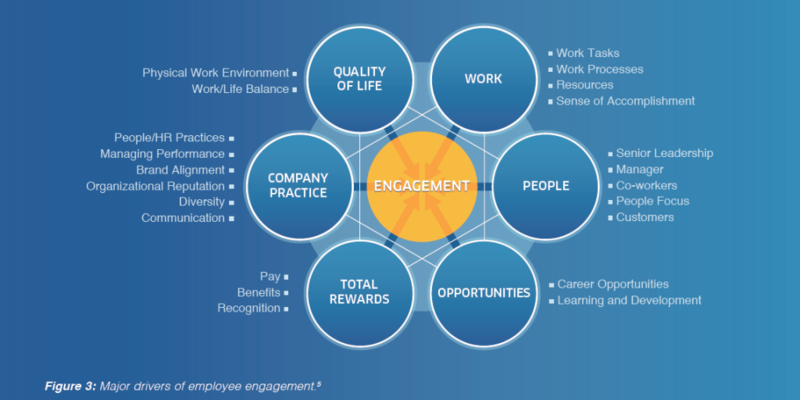 Source: “Employee Engagement in Theory and Practice: Why Should You Care About Employee Engagement?” (2015) Microedge.com. MicroEdge, LLC. With limited time and resources, what should leaders focus on? Research points to the following as the top four issues to improve engagement: Role Design, Organizational Identity, Career Ladders and Community. Source: McGregor, Lindsay, and Neel Doshi. 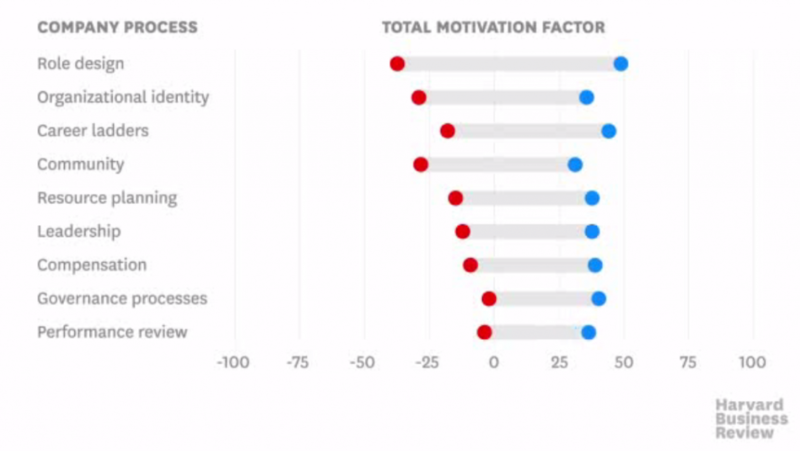 “How Company Culture Shapes Employee Motivation.” Harvard Business Review, 20 Apr. 2016. At limeSHIFT, all of our workshops establish collective intention setting. We help employees connect with their own source of purpose and connect that with the people and environment around them (People, Place and Purpose). Under this lens, we view Role Design as more than the tasks assigned to the employee. Effective Role Design means an individual has a clear purpose within a collective context. It helps to set boundaries, empowers individuals within the collective and creates ownership by building out spheres of influence (see our methodology in Figure 3). Thus, our work also influences both Organizational Identity and Community. Align individual and organizational values and give people a sense of ownership in the company and employee engagement will drastically improve. We know because we’ve seen it. The spark of excitement from a new collaboration. The renewed vigor for work. The pride that tilts an employee’s chin up slightly higher. Those are the clear signs of engagement that we get to see after a limeSHIFT workshop. 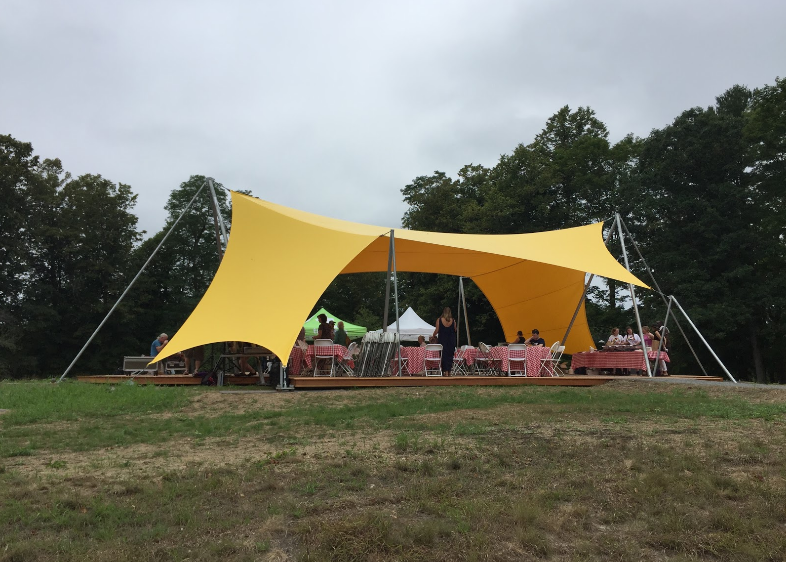 In the coming months, “The Meeting House” will host community gatherings to encourage dialogue, growth, and healing surrounding the issues that “The Meeting House” itself explores. Reflective of limeSHIFT’s mission, “Using social practice art to shift communities and bring about empathy, healing and collective inspiration”, this project seemed fitting to look at through the lens of our own work. Below is an interview I conducted with the Los Angeles-based artist responsible for “The Meeting House”, Sam Durant. Jesse Ryan: I want to start by asking you how you got to where you are today, how you got to creating “The Meeting House” and where the project came from. What was its inspiration? Sam Durant: When I was invited to do this project about a year ago, the Black Lives Matter movement was really in the news–first of all, the police killings of African Americans, but also larger issues of institutional racism. And when I grew up, I grew up during the desegregation of the school systems and the attempt to do that through bussing. So, going into the project I knew that Boston, still, is even more racially segregated now than it was back then in the late 60s and early 70s. So, to me, it seemed like a lot of historical things were playing out again, and the site being so important to American history, with the Minuteman park there and the war and the transcendentalists and the underground railroad, that’s what I was thinking about. JR: “The Meeting House” is no exception to the sociopolitical undertones I’ve noticed in a lot of your work. Where does that come from, and do you view your work as art, or as an artistic approach to activism? SD: That’s a good question, it’s a tricky one. I think it really depends on any one situation. Art can sometimes have a kind of activist feedback in the real world, but I would say my work is art more than anything else. It is aesthetic, it operates in the realm of representation. It is not a political activity or a political action. Sometimes an artwork can have political effects in the world, but that is not where I would locate my work. It is really about representation, not reality. It is about imagination and creativity. JR: Where did the concept for this big yellow outdoor structure come from? SD: It came about through a combination of a lot of factors. The Trustees of the Reservation, who invited me to do this project and to put an artwork in the landscape, they wanted something that was publicly visible, that would get people thinking, and something that was maybe even a little provocative. With that in mind, I thought I should do something that would be visible from the road, from the Minuteman Park, and from The Old Manse itself. The idea for the structure itself was to use the 18th century houses that the first generation of free Africans had built in Concord as a sort of platform. That became the floorplan of my structure: symbolizing the history and bringing back the presence of that first generation of Africans in Concord, but then trying to open it up. 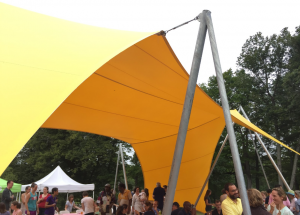 So the tent structure was about looking forward–being transparent and temporary but also hopeful for the future. 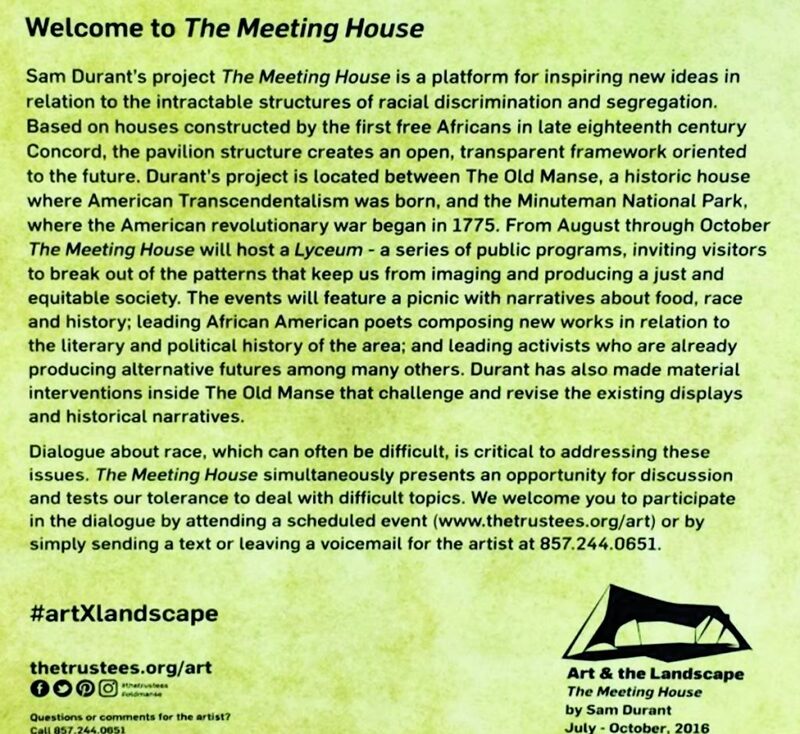 JR: What gives art this power to bring people together, start dialogue, and transform spaces in the way that the meeting house is already doing? SD: Well work like this shows you that art actually is a powerful thing in society–it is important to people. I teach art and my students often wonder, “What is the point of doing art? 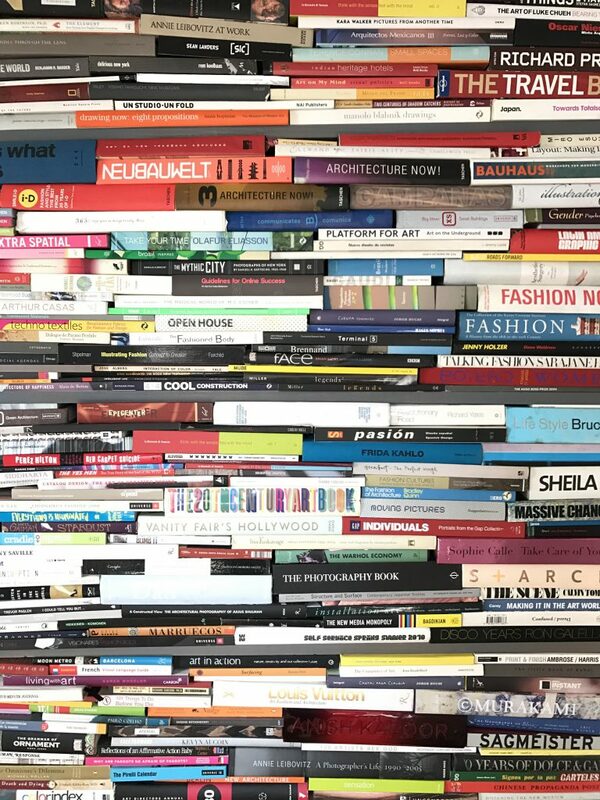 Does anyone really care?” And I always point out that if you look at the New York Times, there is a section in the paper–its own section–that is devoted to arts and culture. And if you think about it that way, that must mean it’s pretty important, you know? There are a lot of things that we do in the world that don’t have their own section in the New York Times. I really is important to us, but I think we often forget that. Even on the most basic level, art is an expression. I think that is what gives it the ability to bring us together. Any kind of art or literature or film, any kind of music, it is all an expression–of humanity, I think… Of the possibilities that we have as individuals, but also as groups, to do meaningful things and do inspire each other. Get updated on our projects and engagements!